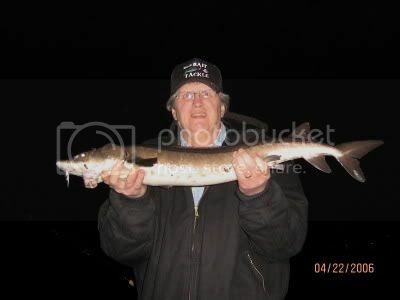 Catfishing has been a little slow around my neck of the woods lately "pool 2 Mississippi river" so we decided to head over to the St. Croix for some Catfishing. Saturdays weather was perfect with warm temps and light winds it was great to be in a boat and on open water. It was kinda slow during the daylight hours but we did have action with a couple of large sheapshead schools that passed through so at least the poles were bending, we tried worms, cut Sucker, full Sucker, Fatheads and Stink bait. Around dark the sheepshead turned off and this guy showed up. 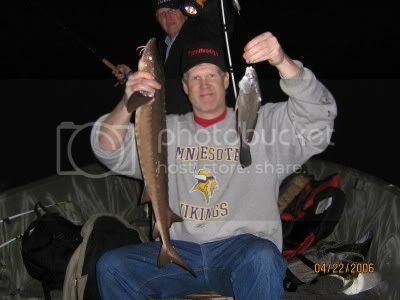 That's Bob Moore from Moores bait and Tackel "58th and Lyndale S. in MPLS" with his first career Sturgeon. 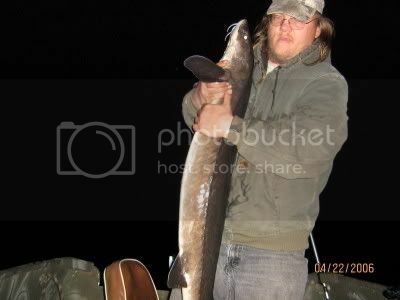 And then my good friend Dave who was kind enough to take us out fishing hooked into this Monster 56" 44 pound dinosaur. These creatures are amazingly strong and fast this fish immediately jumped 3 feet out of water and then decided to drag us around the St. Croix until he was done playing with us. Here is double I had with a Sheepshead and Sturgeon. It was a great trip and I can't wait to target these fish when the season opens this fall. 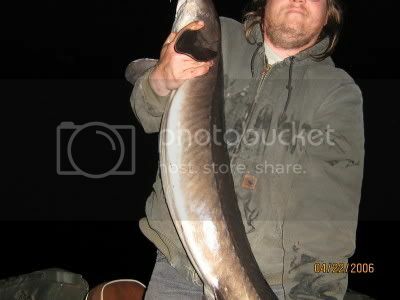 Nice work, those sturgeon look like a BLAST!!! Keep up the good work. I just got back from the cabin, where I went crappie fishing with CK. Late I will start a thread about it and post the pics, no time right now. 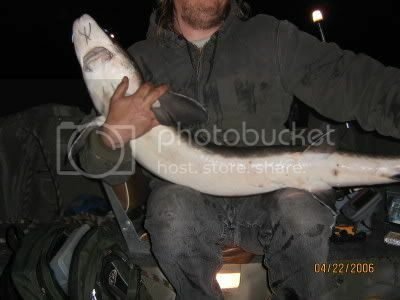 Great work on the sturgeon! Nice 'my fishing pals' hat. Webdude should get hats and stuff made up if there aren't already that I never noticed. The hat is proto-type and needs work still. I'm with Dude, I didn't even notice the hat until now. That is way too cool! Do you think I can fit Bobber Down on one of those???? It's not real cost effective right now I had it made at the Mall of America I need to research it a little more, if we come up with a general design we can find a decent embroidery person and maybe have few made up for decent price, silk screen would save some money also but I like the embroidery look better. 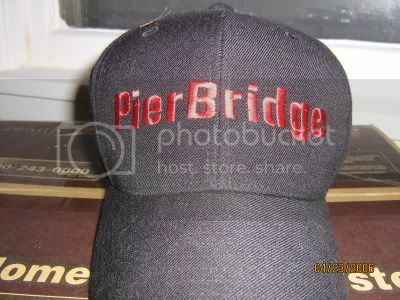 I am a hat wearer and I'd love to get a MY FISHING PALS hat.I'm in PierBridge ,say nice sturgeon.Is that concidered a money fish? ?